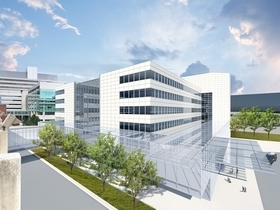 The rendering of expanded facilities includes redeveloping the existing Mitchell Hospital (pictured, southwest view) and turning it into a cancer treatment facility. University of Chicago Medicine expects to pony up nearly $270 million to reopen an adult trauma center and expand services on its South Side campus. The plan, called Get Care, aims to fill a gap in programs the community has called for and boost access in other areas. The proposal calls for a Level I adult trauma center, relocating and expanding the chronically overcrowded adult emergency room and transforming the 33-year-old Mitchell Hospital into a facility that specializes in cancer care with 188 more inpatient beds. More than 1,000 people would be hired to fill new jobs, akin to staffing a new community hospital. The details of the proposal were disclosed in an application the Hyde Park-based academic medical center filed recently with the Illinois Health Facilities and Services Review Board. The board decides the fate of health care projects to prevent duplication of services and must approve the plan. U of C Medicine is a three-hospital system focused on research. It has long been a destination for the sickest patients who need top specialists, notably experts in cancer treatment. But the system is so full it turns away patients, some of whom have fewer places to go as hospitals in other South Side neighborhoods have closed. Its tough stance in particular against reopening its long-closed trauma center for adults triggered years of protests. Adults who were shot or in horrific car accidents were taken to other centers miles away. The system does have a Level I pediatric trauma center, the highest state designation. In September, U of C Medicine answered activists' pleas by announcing a partnership with Sinai Health System to build a center at its Holy Cross Hospital on the Southwest Side. But just three months later, U of C Medicine dropped Sinai from its plans and decided to built its own center on campus after all. • Moving the adult ER from Mitchell Hospital to one that will be built in a parking garage adjacent to the nearby Center for Care and Discovery and expanding the number of ER beds to 41 from 36. • Providing adult trauma services at four trauma bays within the adult ER. • Overhauling Mitchell Hospital, converting it to a cancer center and adding 188 beds, for a total of 805 beds within the system. Here's why U of C Medicine honed in on these three areas. Take the adult ER. It's one of the busiest in the city, treating more than 57,000 patients a year. Patients often have to wait long hours before they get treated and sent home. The capacity crunch is projected to get worse. The new ER would cut the average length of stay from about seven hours four and a half. The adult trauma center, expected to treat about 2,700 patients a year, would be the only such center on the South Side, where half of the local trauma patients are injured. Now patients must trek miles to other trauma centers, such as Northwestern Memorial Hospital in Streeterville or Advocate Christ Medical Center in south suburban Oak Lawn. As U of C Medicine expands its adult ER, it would need more beds for patients who end up needing to stay overnight. Add to that double-digit growth in specialty services like cardiology and orthopedics in recent years. Those patients need beds, too. Yet the system is often full. Giving Mitchell an extensive makeover and adding beds should help alleviate the pressure and provide more patients access, O'Keefe said. She added that all three aspects of the plan are needed to make it financially viable. Emergency services at U of C Medicine are money-losers. Half of the patients are uninsured or on Medicaid. In fiscal year 2015, services in the adult ER resulted in a $32 million financial loss, the application said. “These losses will likely grow with the addition of trauma services,” the application said. Filling some beds with patients being treated by specialists could help balance out the losses. Cancer care, for example, is a lucrative service for a hospital given the expertise and lengthy and expensive treatment involved. U of C Medicine plans to pay for the project with $68.8 million in cash and taking on $200 million in debt through a bond issue. The application also provides a further glimpse into why U of C Medicine decided to forgo a joint venture with Sinai and open the trauma center on its own. U of C Medicine would have provided $43 million in capital for facility improvements to open the center at Holy Cross Hospital near Marquette Park. The system also would have provided specialists, notably experts in orthopedics and neurosurgery. With modern operating suites at U of C Medicine, compared to the aging Holy Cross—a community facility—the best solution was to house adult trauma services at U of C Medicine, the application said. The system noted “suboptimal” critical support facilities and inefficiencies with physician staffing as “cons,” the application said. Sinai spokeswoman Dianne Hunter said part of the plan all along to open a center at Holy Cross involved a big build out and recruiting more staff. Besides the facilities board, the Illinois Department of Public Health and a regional trauma committee made up of directors of rival Chicago trauma centers also must approve the proposal. If approved, the new adult ER and trauma services would open about two years later, followed by the extensive renovations at Mitchell. The entire projected is expected to be completed by 2022. "Here's a first look at U of C Medicine's $270 million trauma center, expansion plan" was first published in Crain's Chicago Business.